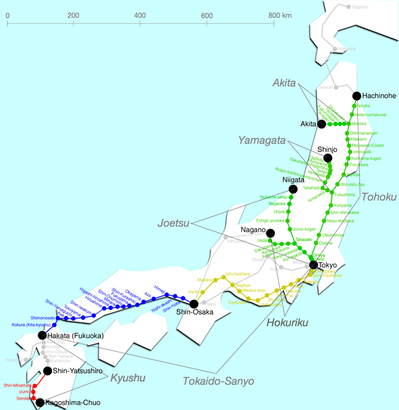 High-speed rail lines have been built and proposed in numerous countries throughout the world. The advantages of such lines are a higher quality of service than competing modes (air, bus, auto, conventional rail), potentially faster point-to-point times depending on specific locations, faster loading and unloading times, higher safety than some modes, and lower labor costs. The disadvantage primarily lies in higher fixed costs, potentially higher energy costs than some competing modes, and higher noise externalities. Whether the net benefits outweigh the net costs is an empirical question that awaits determination based on location specific factors, project costs, local demand, and network effects (depending on what else in the network exists). The optimal network design problem is hard (in the mathematical sense of hard, meaning optimal solutions are hard to find because of the combinatorics of the possible different network configurations), so heuristics and human judgment are used to design networks. The network architecture of high-speed rail lines has tended to be in a hub-and-spoke pattern, connecting a hub city (e.g. Paris, Madrid, Tokyo) to secondary cities in tree-like architecture, with occasional crossing links, typically at both lower speed, lower frequency, and lower cost of construction. As these systems were designed nationally, and the largest city is often the capital (as in Paris, Madrid, and Tokyo), which is also (roughly) centrally located, it is no surprise that the hub was based where it was. Germany has fewer very high speed links (faster than 300 km/h), and a flatter (less-hubbed) network, perhaps reflecting its strong federalism, relative decentralization into a multi-polar urban structure and late formation into a nation-state. Italy has centered its hub in Milan, the largest metropolitan area in the country. Maps of International HSR systems are shown in . The reason for the hub-and-spoke architecture is to achieve economies of density in track usage and network effects at the hub city which enable frequent service to multiple destinations. Multiple paths between origins and destinations would diffuse the network effects and result in less frequent service, and therefore reduce demand. The hub-and-spoke architecture, while benefitting the network as a whole when demand is insufficient to enable frequent point-to-point service, clearly benefit the hub cities the most, as they gain from all the incoming flows which create additional demand, and thus greater service. In air transportation, airlines often use hub-and-spoke networks, and if they have a large market share at a hub airport, will use that advantage to charge a premium for travel, thereby capturing some, if not all, of the benefits of being located in a hub airport city.